Celtis occidentalis tree trunk with corky bark. Dutch Growers Garden Center.netpsplantfinder.com (Accessed 12/2016). 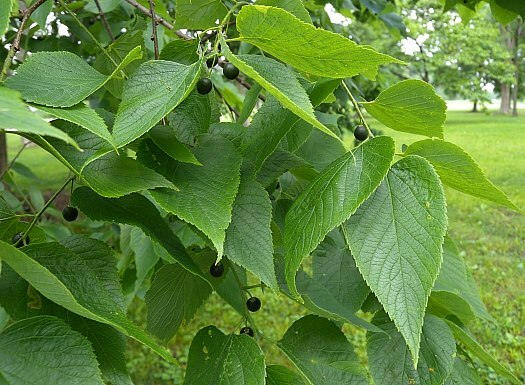 Celtis occidentalis is a tree to 15 m tall, lives about 150 years; deep rooted, roots associated with ectomycorrhizae; bark silver-gray, usually warty; older twigs hairless, slender, zigzagged, pith chambered near nodes, stipule scars present, winter buds appressed to twig, triangular, pointed, scales 4-5, hairy, overlapping, leaf scars with 3 vein (bundle) scars (Harlow 1946; Petrides 1988). Celtis occidentalis leaves with fruit.John Hilty.www.illinoiswildflowers.info (Accessed 12/2014). Leaves alternate, stalk 1-1.5 cm long; blades of flowering branches 6-12 cm long, egg-shaped, tip tapered to an elongate point, base unequal, slightly lobed on one side, surface rough above, hairy below, elm-like, dark green above, paler below, major veins three at leaf base, secondary veins pinnate, impressed, margin sharply toothed, except for base; new leaves on vegetative shoots sometimes >12 cm long, finely hairy on both sides. 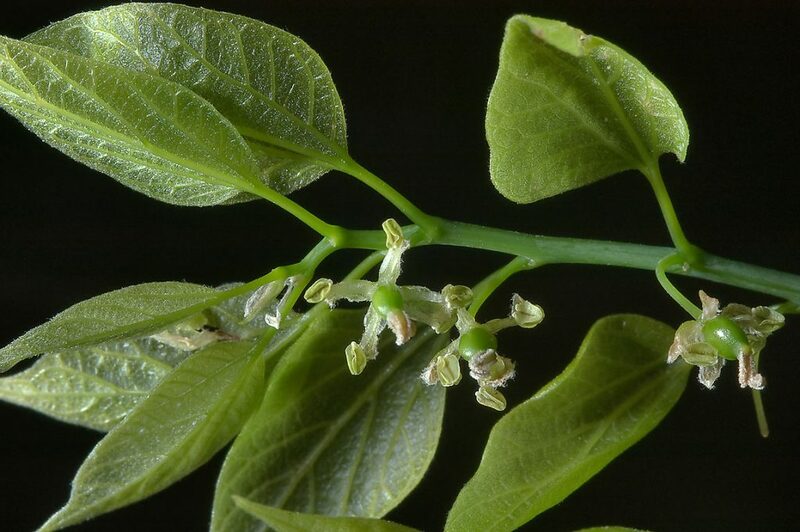 Celtis occidentalis flowers and new leaves. photo courtesy of Alexey Asergeev, photo 846-07. www.asergeev.com (Accessed 12/2017). Flowers polygamo- monoecious (sexes sometimes on separate flowers), small greenish, Blooms May. Fruit thin-fleshy, black, hard, to 1.3 cm, sweet, 1-seeded, ripening Sept.-Oct., persistent. Dispersed by birds through winter. Seed load 43%. Pulp nutrients: water 37%, lipid 1%, protein 3%, CHO 63% (White 1989). Seeds must overwinter before germinating. Habitat: Moist soil in open woods and edges, around old concrete, over shell middens in southern Staten Island, Soil pH 6-7.8 (USDA, NRCS 2010). In NYC found on soil with pH 5.2-7.7 (Gargiullo, unpublished data). Tolerant of salt and drought. Moderately tolerant of flooding, up to 25% growing season, saturated soils, and soil compaction; shade index 4-6 (Hightshoe 1988). Asterocampa celtis larva,© McGuire Center, Moth Photographers Group. I_MPG10080. discoverlife.org (Accessed 12/2017). Notes: A host tree for the Asian longhorn beetle, Anoplophora glabripennis (see Norway maple, Acer platanoides). Leaves eaten by larvae of the hackberry butterfly, Asterocampa celtis; snout butterfly, Libytheana carinenta; question mark butterfly, tawny emperor, Asterocampa clyton; Polygonia interrogationis, eastern comma, P. comma, mourning cloak, Nymphalis antiopa, butterflies; Lepidoptera (Opler 1992; Tallamy 2003). Stems often form dense outgrowths of small branches, (witch’s brooms) caused by a mite (Eriophyes celtis, Eriophyidae) and/or a powdery mildew (Sphaerotheca phytophila, Ascomycotina), (Burns and Honkala 1990, Agrios 1988); Attacked by up to ten gall-producing mites of the genus Pachypsylla (Homoptera, Psyllidae). 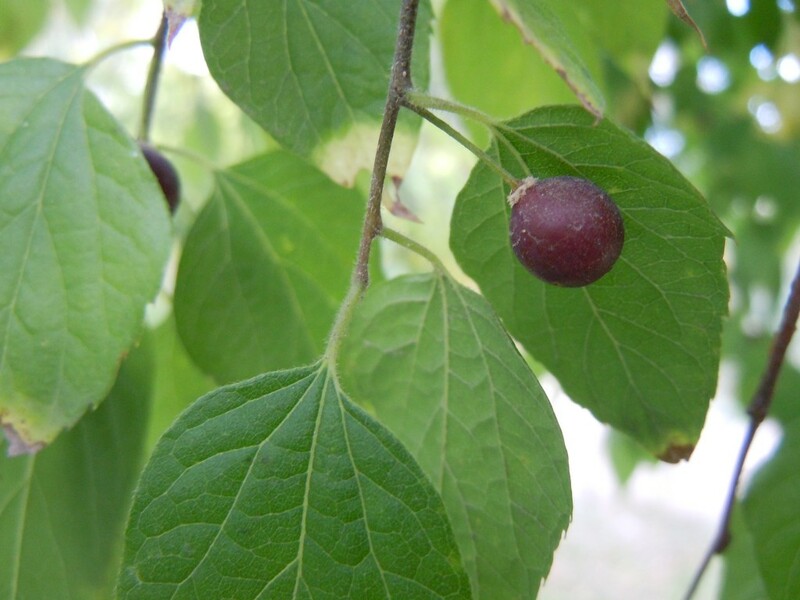 The two most important are P. celtidisvesiculata, the hackberry blister gall maker, which appear as slightly raised, warty, pale growths, 0.4 cm diameter on the upper leaf surface. The hackberry bud gall psyllid (P. celtidisgemma) infests leaf buds. These insects feed on plant cells with sucking mouthparts but usually do not cause great damage. 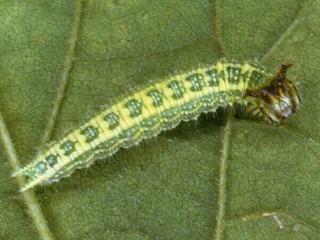 Psyllid populations are controlled by several parasites. Including the chalcid wasp Psyllaephagus pachypsyllae that destroys bud gall nymphs, Conotrachelus buchanani, (Curculionidae, snout beetles), a weevil, preys on psyllids and also eats galls. Celticecis spiniformis, a thorn gall (Diptera, Cecidomyiidae), is the most widespread gall maker on hackberry. It causes a conical, round-based, thorn-shaped gall on leaf undersides, ca 0.3 cm high (Johnson and Lyon 1991). 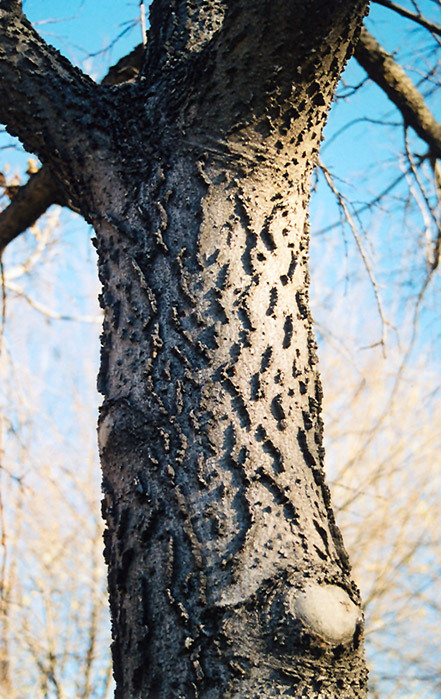 Hackberry is highly susceptible to fire damage that allows entrance of decay fungi. One of these fungi is Oxyporus latemarginatus, (Polyporaceae, Basidiomycotina), which causes root rot and often infects trees with fire damage. It may appear as a white mycelial mat near the tree base. On dead or dying trees it may form a whitish fruiting body (Basidiocarp). Hackberry leaves may be infected by the downy mildew (Oomycetes) Pseudoperonospora celtidis (Mastigomycotina, Peronosporaceae), which can kill leaves (Sinclair et al. 1987).